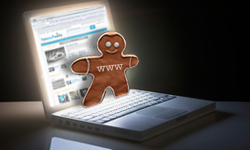 Home › Non-techie PC Users › What are Cookies on the Internet? A cookie is a small bit of information that a website puts on your computer hard drive so it can remember something about you at a later time. When you revisit the site that created the cookie, your browser shares the cookie with the site while it’s loading the page. This is usually for the purpose of reminding the website about useful information such as custom preferences you may have set during your last visit or remembering the username and password to log you back into a site without having to retype the information. There are 2 types of cookies you should be aware of when you are browsing the internet. Temporary (or session) cookies only last during a single browser session, meaning that when you close the browser the cookies are removed from your computer system. Persistent cookies are saved to your hard drive for longer, designated periods of time, which vary from site to site. Cookies that save your login information for website are persistent cookies, which are usually stored for no longer than 2 weeks at a time. When it comes to online privacy and security, cookies can become a concern. Many web experts question internet privacy when cookies are used to track user behavior, especially when the user hasn’t given their explicit permission and the site in question is trying to make money off of what they know about you. First-party cookie is the technical term for a cookie that tracks your activity across a single Web site or a single domain (for example.cnn.com). In most cases, we visit these sites willingly. 3rd-party cookies, on the other hand, are usually associated with the ads that appear on various websites. These ads are served up to visitors by 3rd-party ad networks, which often store cookies on a computer and can track your browsing behavior for across multiple websites. The intended purpose of these cookies is to help the ad network learn more about your internet habits to serve you ads related to your interests. The security of these types of cookies is questionable because we as web users usually have no idea that the ad network is storing cookies on our PCs. Many web users ignore cookies altogether, but it is possible to regularly clean out your cache of cookies, as well as to block specific cookies altogether (please be aware that some websites will not operate properly without the ability to save cookies). If you’re about to visit a site that makes you uncomfortable, most major browsers let you restrict cookies on a per-site basis. In Internet Explorer,, go to Tools → Internet Options → Privacy. Click the Advanced button for general cookie-related settings. To override your general settings, click the Sites button. In Firefox, go to Tools → Options. Click the Privacy tab. For fine-grained control, click the Exceptions button. In Google Chrome you can open what is called an “incognito” browser window which blocks cookies for any websites opened within that browser window. You can also simultaneously run a regular browser window that continues to allow cookies. When using incognito browser windows, however, websites you visit can still save information about you on their servers. In Internet Explorer 6 or Internet Explorer 7, go to Tools → Internet Options → Privacy. Click the Advanced button. Select the “Override Automatic Cookie Handling” check box. Under “Third Party Cookies,” choose Block. In Firefox, go to Tools → Options. Click the Privacy tab. Clear the “Accept third-party cookies” checkbox. Rather than obsess about each and every cookie that’s placed on their PC, many web users allow all first-party cookies and then clear them out every few months as part of their routine maintenance. Every browser lets you erase the stored cookies along with all of the other pieces of personal information (e.g., browsing history, temporary files, saved form information). If you’d rather save some cookies and erase others, third-party tools are also available and can make this process easier. Cookie Monster will compare your cookie cache to your Favorites list so that you can keep the cookies from well-known sites and erase the rest. CCleaner is a free, all-in-one tune-up utility. Go to Options → Cookies, and you can protect the cookies that you trust while erasing the rest. You can use this knowledge of cookies to stay safer on the website and reduce the risk of having your important, private information from getting into the wrong hands. Managing your cookies will help you stay more at ease when it comes to being concerned about your online privacy and security.